Cheapest I can find for Christmas. Good reviews for folding flat baby bouncer. Bounce to the moon and back on this baby jumper with the cutest characters on the block. 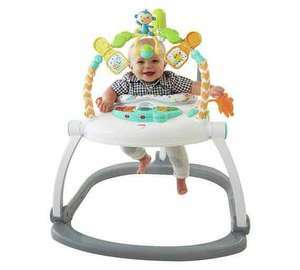 Baby's natural jumping and kicking send this seat bouncing up and down with lights, sounds and musical rewards and has interactive toys right at baby's fingertips. Hands-on activities to keep baby busy include a colourful, light-up rainbow-key piano, a wiggly-jiggly teether to chew, a clacker ring bar with 3 colourful rings to slide back and forth, a monkey roller ball, spinners and a toy to click-click-click. Jumping & busy hands-on activity play encourage all-around development of baby's motor skills. Paid £55 at asda 2 weeks ago; this is a great price. What age are these suitable for? A child that can hold their head up unassisted but can't walk yet. So depending on you child 4-5 month and up.